From the New York State Thruway (Interstate 87) take exit 21B, at Coxsackie. Turn left onto Rt. 9W south and travel 3 miles to Rt. 81. Turn right onto Rt. 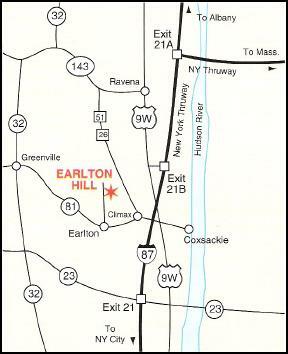 81 west and travel 4 miles to the hamlet of Earlton. At the Earlton Firehouse, turn right onto Medway-Earlton Road and continue 2 miles to the campground on right. Blue and white destination signs are also posted to assist travelers in reaching our destination.